Just hearing the words "bed bugs" causes grief and discomfort to homeowners and business owners throughout the region. Emergency Environment Control is ready 24 hours a day/7 days a week and every day of the year to address your emergency bed bug crisis. We only staff experienced trained professionals who have taken care of a wide range of bed bug issues. We have seen it all! Call us at 631-862-2560 with questions or to request an on-site emergency response to your bed bug problem. 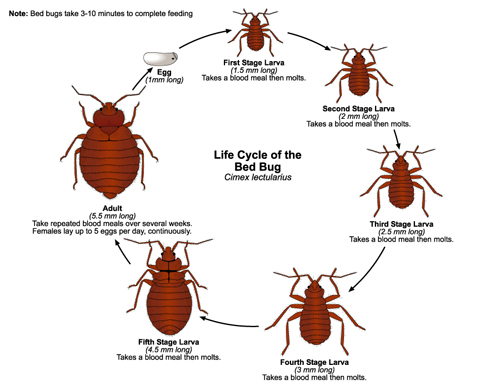 Bed bugs are six-legged nocturnal insects that feed only on blood, usually that of humans or warm-blooded animals. The most common bed bug, Cimex lectularius, is the species most adapted to living with humans. Adult bed bugs appear mahogany to red in shade and are flat and oval-shaped. They can grow to be no more than ¼ inch. Immature bed bugs (nymphs) resemble the adults, but are smaller and somewhat lighter in color and can appear translucent. Because of their morphology, bed bugs can live inside mattresses, baseboards, box springs, headboards, and many other cracks and crevices around the house. Bed bugs can lay 200 to 500 eggs during their lifetime. Under normal room temperatures and with an adequate food supply, bed bugs will typically live up to a total of 316 days. If you’re waking up covered in curious bites, it may be time to seriously consider whether you have bed bugs. Because different people experience different reactions to bites from bed bugs, there’s no one specific way to describe how they appear. However, they do tend to appear as raised red bumps and also usually in clusters or patterns of three or four. Waking up with bites would probably be the first indication. Also, since bed bugs can travel easily in between walls, if you find out that any of your neighbors or people living in apartments adjacent to yours have bed bugs, it would probably be a good idea to get your apartment checked. We have years of experience fighting insects of all kinds and employ a wide range of methods to combat bed bugs. We will come into your home and determine the best route to control and remove the bed bugs from your bedroom. Emergency Environmental Control serves Long Island (Nassau and Suffolk) Queens and Westchester. We are a licensed, owner-operated bed bug removal and control company. We provide 24-hour service, 365 days per year. Please contact us today with any bug or pest control issues you may be experiencing! All our clients have access to the owner's personal cell phone. Call Lenny Bilski any time. His direct cell phone numbers are 516.983.7910 or 631.334.8899. We look forward to helping you get rid of any bug issues you may have!